The Jungle Book, Now With More Cybernetics! What if Rudyard Kipling had been born in the 25th century instead of the 19th? Perhaps, rather than being influenced by the British Empire's reach in India, his work would be influenced by the increasingly far-reaching grasp of technological empires, the Googles and Apples of the future. I suspect The Jungle Book would still work well, several centuries from now, as a set of allegories about politics and imperialism. 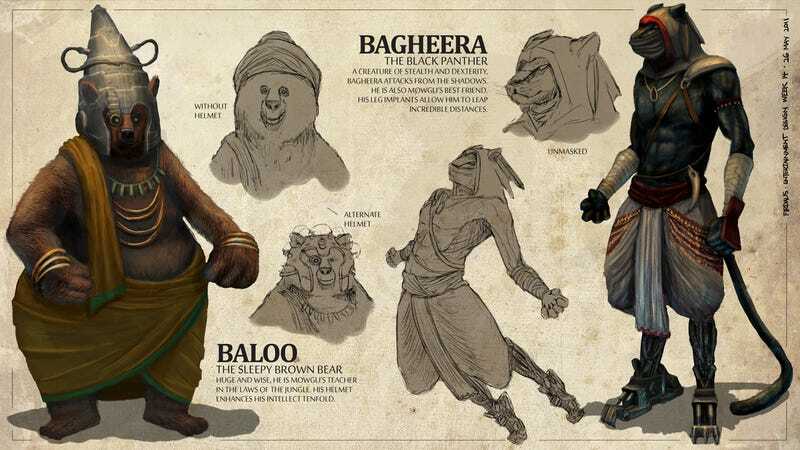 Here, DeviantArt user freakyfir re-imagines characters from The Jungle Book - Mowgli the man-cub, Baloo the sleepy brown bear, Bagheera the wise panther, and Shere-Khan the arrogant tiger - as if they were artificially enhanced with machine implants. It's a childhood allegory told from the future.